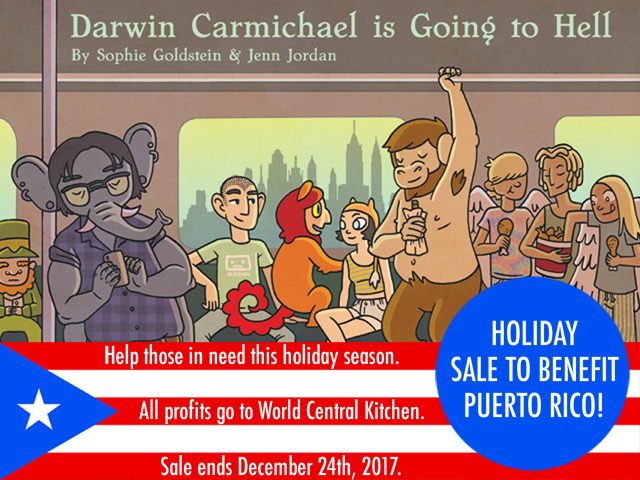 Perhaps you are starting your search for holiday presents, so I wanted to let you know Jenn Jordan and I are selling copies of our graphic novel Darwin Carmichael is Going to Hell to benefit Puerto Rico. Buy it on our Darwin Carmichael store page! In 2013 Jenn and I crowdfunded DCiGTH on Kickstarter so the printing is 100% paid for and the only expense will be shipping, which in America comes out to $3.61 a book. That means that for every $25 book sold, $21.39 will go to World Central Kitchen! Please consider checking out their website and donating directly if you don't feel like grabbing a book. Thanks for being generous, wonderful people!